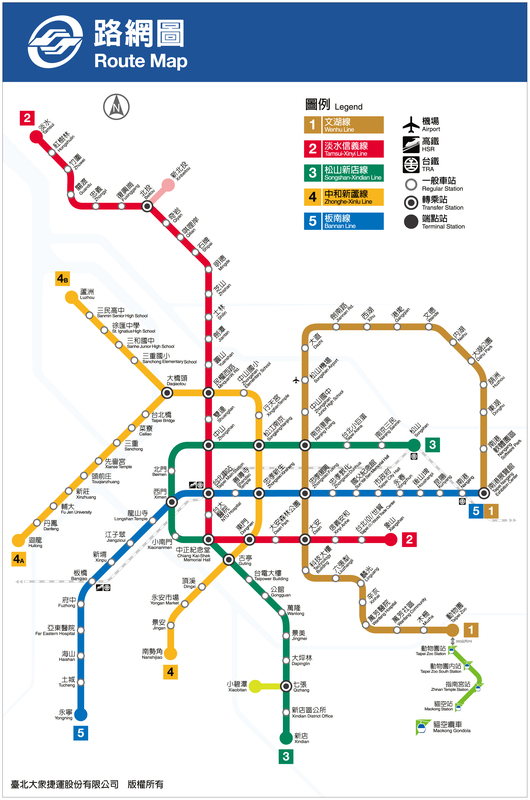 The mass rapid transit system (MRT) in Taipei and Kaohsiung, together with the metropolitan areas dedicated bus route networks, forms a convenient transportation system. Taipei MRT StationThese lines are dotted with a variety of attractions and scenic spots, allowing visitors to take a leisurely journey through some of the most attractive parts of Taipei. Auto ticketing machiness can be found in all MRT stations, providing ticketing services. Single-journey ticket prices range from NT$20 to NT$65 depending on travel distance. An NT$150 one-day pass purchased from A service booth allows unlimited travels on all MRT lines within one day. To provide passengers a comfortable and safe ride, smoking, drinking, and gum chewing are strictly prohibited in MRT trains and stations. Using cellular phone is prohibited in the first and the last coaches of the train. Tickets are valid on the day of purchase.Please place pets in hand-carry cages, except for police dogs and guide dogs. A one-way ticket costs NT$20 to NT$60 depending on travel distance. KRTC also offers a "One-day pass", "Stored-value Ticket" and "Group Ticket".